When looking for straightforward app to check drive SMART I went for DiskSmartView and managed to overlook pure gem in this area – CrystalDiskInfo. I change versions for this one all the time at Appnews, but strangely I forgot to check it out properly. Turns out it is more than impressive disk informational utility that is diligently kept up to date by developer. 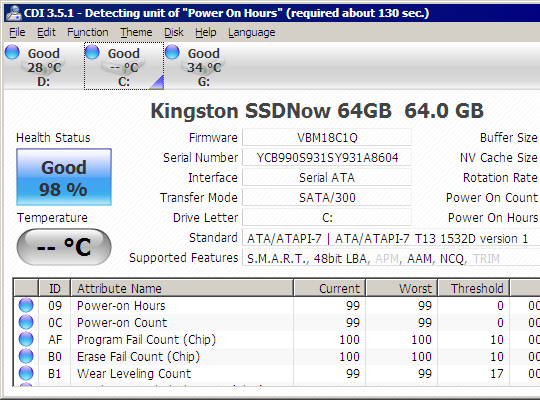 App is very comprehensive and covers both informational parts of hard drives (SMART attributes, supported technologies) and possible tweaks of drives (acoustic and power management). App is also made as background running type in mind. There is option of temperature indicators in system tray, tweakable rescan interval and even graph of SMART attributes over time. App is very well maintained and supports the very latest features and information, such as SSD-specific SMART attributes. It also attempts to get SMART information from external drives, connected via USB or FireWire. Something I thought impossible out of habit (checking back PC Wizard can pull that off as well, but DiskSmartView cannot). Interface is little glossy for my taste. There is an export option, but only to plain text format. Works fine, but Nirsoft apps spoil us with extensive export functionality. App does about same stuff that other in its class. But best value here is accurate development and support of all latest features. Open source with natively portable option.